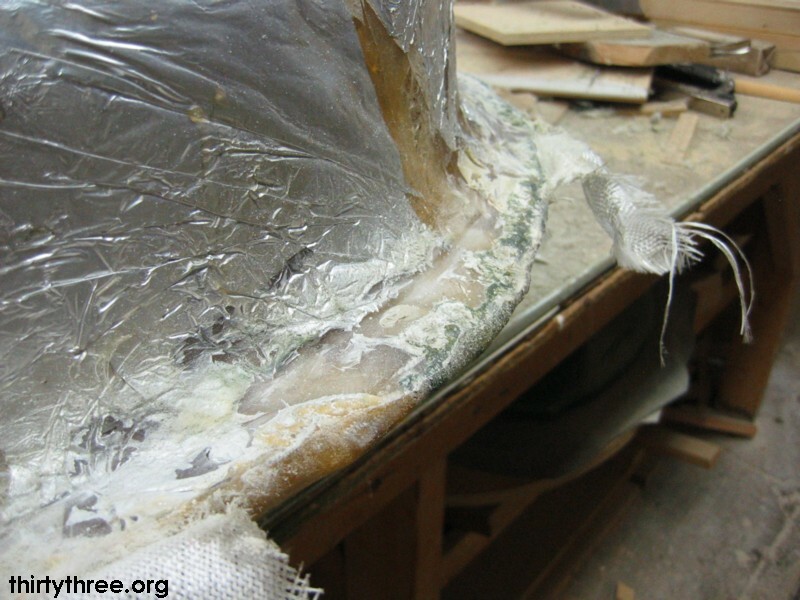 You have two choices at any place you go to buy fiberglass, matting and woven cloth. I’ve found matting works great for the big work, the heavy duty areas. Like the base of the unit you are building. You’ll want to use the woven glass for the finer areas, such as when you are trying to put the final top facing surfaces on, etc. 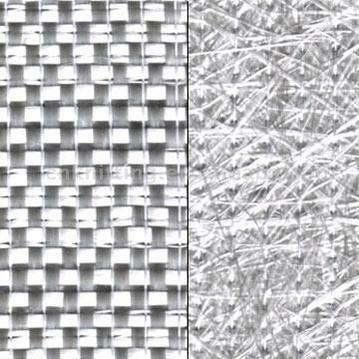 Woven stuff can be more of a pain to work with because it stretches and pulls apart different than the matting does. They are usually about the same price. Buy a LOT of resin, it is usually about 35$ a gallon and you’ll use more than you’ll first realize. You’ll spend a lot more if you keep buying quarts. The resin comes with hardener, it is a small clear liquid that you mix with the resin and mix up very well. It takes some practice to learn how to get the mixture right for the curing time that you want. I would recommend playing with it first with some pieces of fiberglass cloth and accustom yourself to how long you have to work. You’ll want it curing in 8-12 minutes, and this length of time is determined by the amount of hardener you use. If you use too little you will find that hours will pass and it won’t dry very quickly. Sometimes it can take days if you don’t use the right mixture, but it will usually always harden up eventually, and this is why it is very important that you mix it up each batch well. You do not want to have to deal with unhardened resin, it is a mess. You’ll need plenty of containers to mix it all up in, disposable plastic pails from a hardware store with graduated markings on the side would be ideal. You can usually get a few uses out of one if you let it harden all the way before mixing up another batch. You can find or buy a bunch of stir sticks, dowels or clean, strong debarked twigs would work. Latex Gloves are a must. This stuff gets absolutely everywhere and you’ll save a lot of solvent on your hands if you use gloves. Get some thick plastic to throw down on whatever surface you are working on, you will inevitably make a mess as you race against the clock trying to use your batch before it hardens. It is much easier to wrap everything up at the end of the day. I used the same plastic for a few weeks and then just tossed it when I was through. 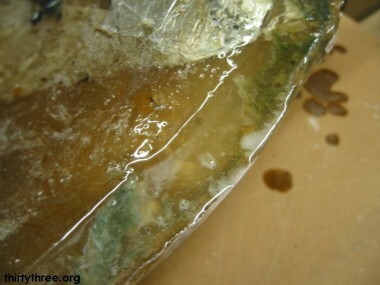 After the resign drippings have hardened on the plastic it is essentially clean for the next use. For applying resign and working it into your matting, a paint brush is going to be ideal. There are many lengths of bristles and you’ll need to find one that is firm enough to press resign into the cloth yet soft enough not to tear up the cloth up and make a mess of stringy fibers. You can always use sharp scissors to cut down the bristles to a good length. Buy cheap ones you can throw away after each use, you won’t want to try to reuse your brush. 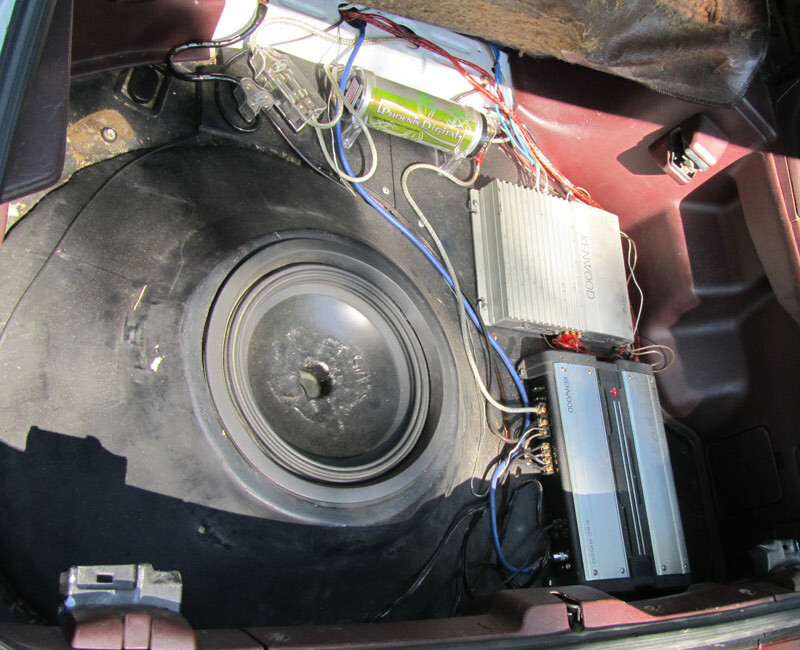 I began the project with my friend Paul, he was building an enclosure that molds to the side of the trunk in his VW for two 8″ woofers. We learned a lot through trial and error on his project as well. 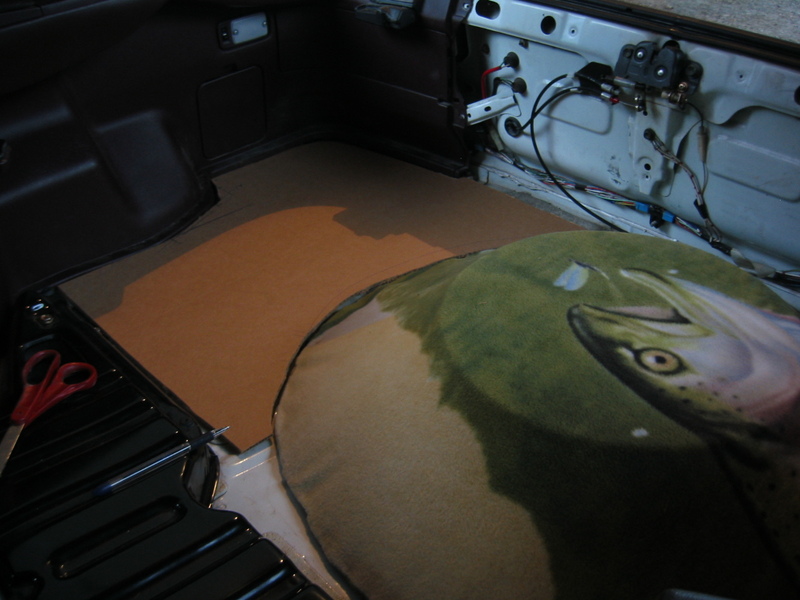 It is difficult to get the resin soaked matting to stick to the walls of the car. We found that if we cut the matting into smaller strips, and use small amounts of resin we could better shape the difficult curves without it falling apart. We laid out the materials on a piece of furniture someone just happened to be throwing away next door. You make a mess so make sure you lay down plastic if you care about your work surface. Mixing resin and hardener is something that you will have to get a feel for. It is difficult to measure out several hundred drops for multiple ounces of resin, so you end up guesstimating – which can have several outcomes. The worst situation I have found is when you don’t put enough hardener in and your project stays wet for days. Here are our trunks lined with tinfoil and the first layer of fiberglass matting. We chose to use matting instead of woven fabric here because the edges of the fiberglass matting can be blended easier into other surrounding pieces than with finely woven fabric. 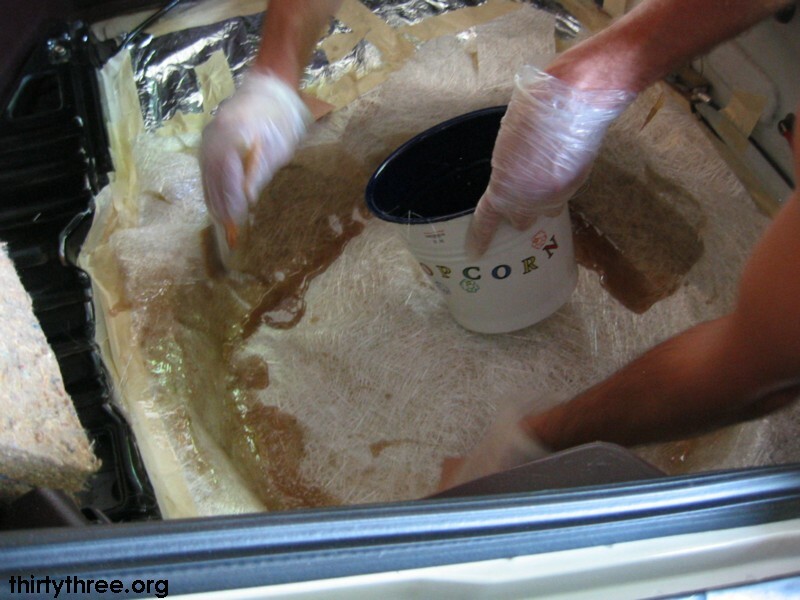 Here we are working together to paint on the resin for the first layer of matting inside the trunk. The area I was working with was so large that having an extra hand can really help to get good coverage before the resin starts to harden. 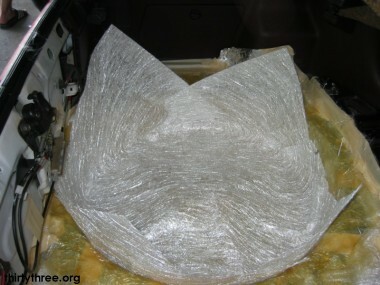 This is the first hardened layer of fiberglass resin in the trunk of my supra. Prep a single piece of matting for the second layer by cutting in the right places so that the matting can fold over itself, making joints stronger. One valuable lesson I learned at this stage was that I should have painted resin on the first hardened layer before laying down the next, which makes it easier for the resin on top to soak through. Painting a layer of resign on first before applying the matting helps the matting stick better and results in a smoother surface with less air pockets. I had to use tools to grind the air pockets down so that I could reinforce the walls with matting and more resin. It was just more work that could have been avoided, and was on the top half of the project. 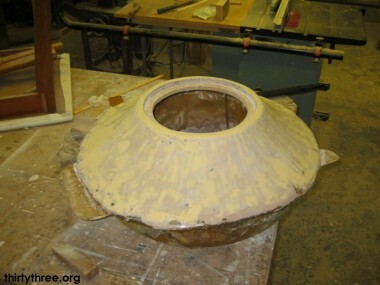 This is the completed bottom mold with the finished sub ring installed. 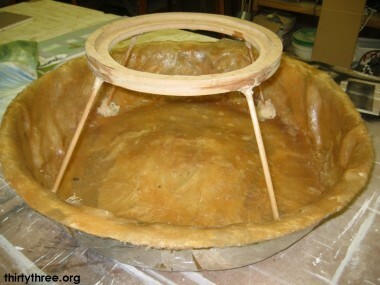 3 layers of glass and 4 layers of resin were used to complete the bottom half. It’s important when you position your subring using dowels that you use enough adhesive to really pin it down. The angles here caused the ring to want to float around quite a bit and I had to go heavy with the glue a second time to get it sturdy enough to hold the first layer of glass. 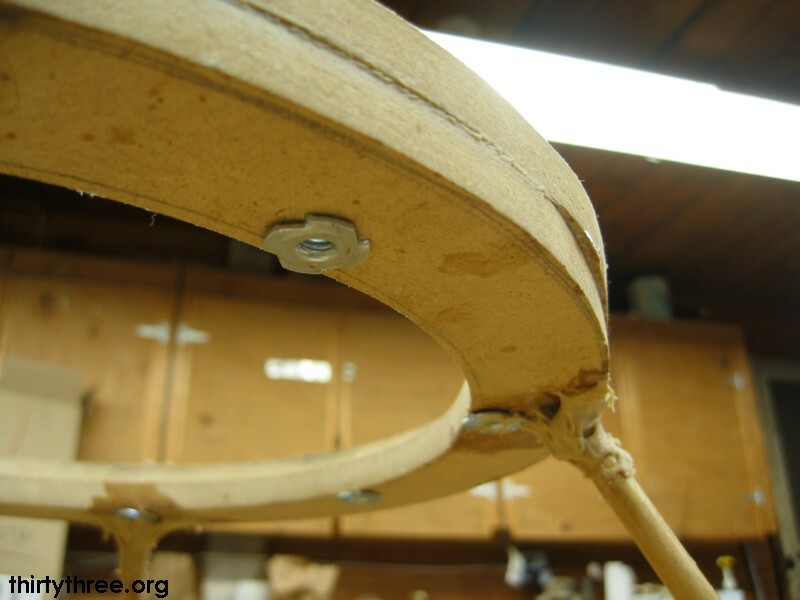 The dowels do not provide any structural strength after the top matting layer goes down. I used some medium density fiberboard (MDF) to create the 2-piece subring which I glued together with Liquid Nails, an industrial adhesive. Pre-drill holes for the subwoofer mounting screws. T-Nuts are used to ensure this would work reliably for years to come. Hammer the T-Nuts into place but also use some glue or resin on them else they will want to fall out or strip the wood around where they grab after you torque your sub down. I had issues with mine falling out and needed to secure them better, which was difficult to repair once the unit was finished. I ended up using resin to reinforce them later on in the finished project. 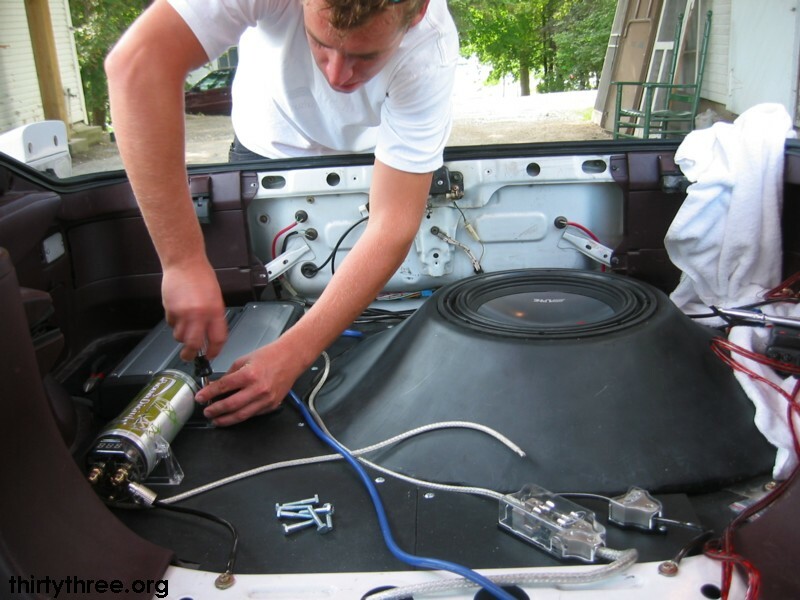 MDF is not inherently strong and they can easily tear through the MDF and spin when you tighten the bolts down when mounting the subwoofer. I would have also used the next smaller diameter mounting hardware if I were to do this again. The larger size that I chose conflicted with the rubber on the top side of the sub. 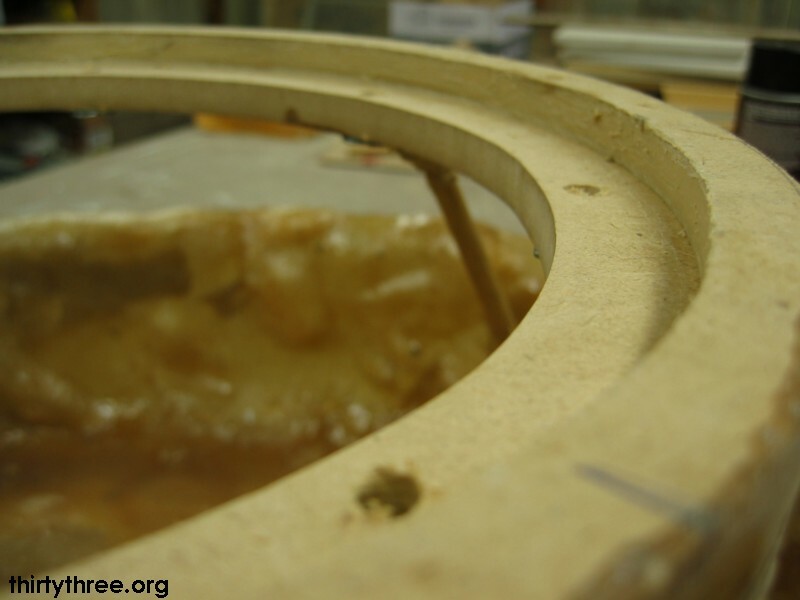 Paint the MDF Sub Ring before gluing it to the base so that moisture cannot be easily absorbed by the MDF. This is the fleece that I used to cover the enclosure. 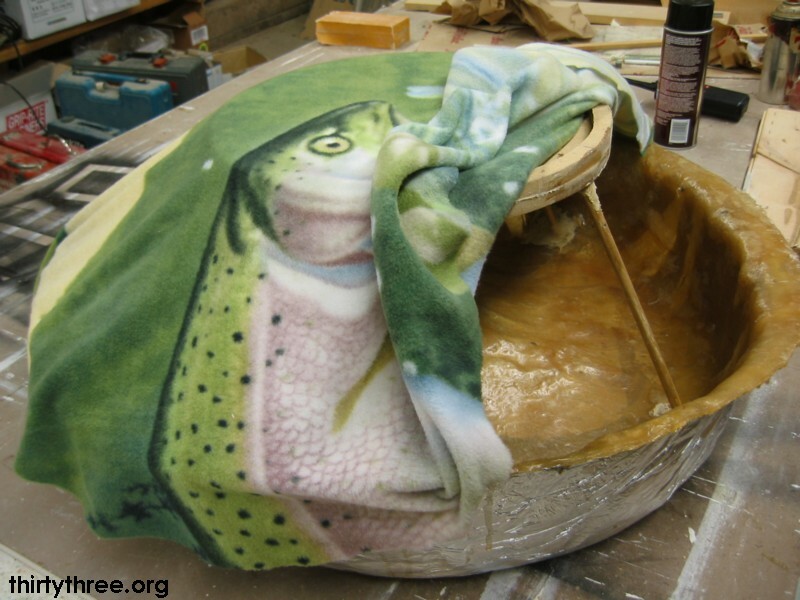 Fleece is a popular choice for smooth shaping these types of projects because it can stretch in every direction, which is especially necessary with a circular project such as this. 3M Super 77 Spray Adhesive was used with great success to tack the fleece under the lip of the bottom mold. It was strong enough to hold up to the abuse of laying the first layer of matting and resin. Here is the covered enclosure in my trunk with cardboard templates that I constructed with the help of a band saw. The process of measuring, marking and cutting with the band saw went very smooth. The band saw is accurate and and kept the cardboard stiff, where as scissors would have mangled it and made for a sloppy template. The templates enabled me to make small adjustments to get the curves of the box right as well as to get up close to the trunk walls. I cut the original pieces out of 1/2″ MDF which you will see together later as the sub floor takes shape. I painted them with oil-based paint but after several years this still absorbed water and became moldy. My Targa-Top was leaking at one time and had allowed water to get into the trunk. My new sub-floor is made of thinner, 1/4″ smooth birch plywood, and cost about 25$ for the 4×8′ sheet. 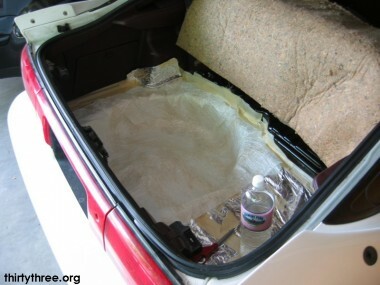 Rubberized undercoating helps to dampen and seal the well of the trunk. I had some rust to contend with here, and used a chemical I bought at an automotive store to neutralize it and dissolve most of it. I then sprayed this area with rust-primer and then with the undercoating. The result will hopefully quiet the trunk a little. 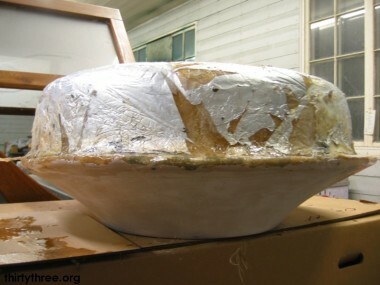 The dried first layer of fiberglass without mounting tabs. Mounting tabs were added between the first and second layers. I put tinfoil in the areas of the trunk where i wanted to mount the enclosure. 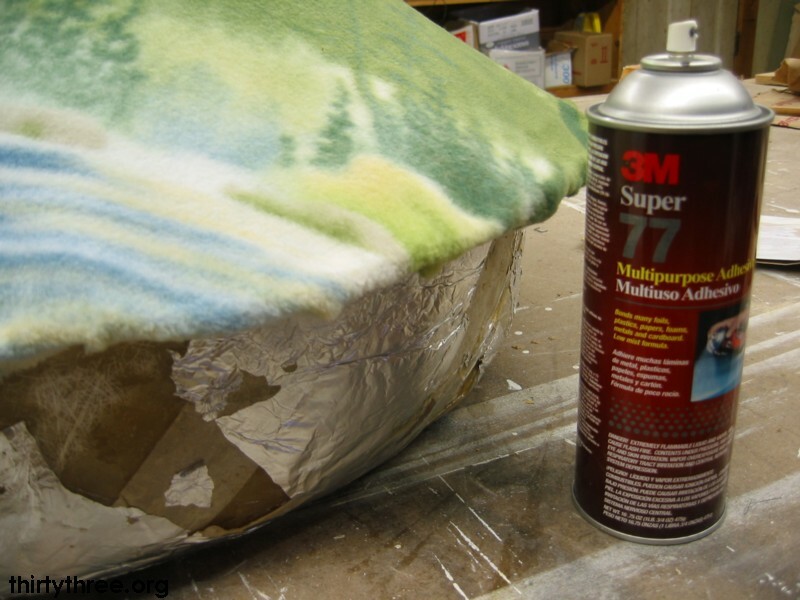 I coated the tinfoil with resin and laid down one layer of matting. Placed the enclosure into the wheel well and placed another layer on the top side of the box and pressed the two pieces together to sandwich the enclosure between the two pieces. This will become the mounting tabs, perfectly molded to the contours of the trunk. I used a handheld rotary grinder with a layered carbon grinding wheel to clean up the edges between layers for a tight fit to the floor of the supra. I found this cleanup process to be necessary to keep the top tight with the base. You’ll see how I sealed these two layers together a few pictures down. Here is my sub floor which will be used to mount the audio electronics to in the trunk. I primed it first and then painted with a thick flat black oil base paint. I felt it necessary to seal the MDF because if water gets to this material it can tear it apart pretty easily. To finish this up I had to pre-drill all the mounting locations into the board and the car. I then countersunk the holes for the mounting hardware, and finally installed Felt furniture tabs which I predrilled and used to suspend the boards above the floor a tiny bit and provide cushioning from vibration and wear. 2013 Update: I am currently re-creating these pieces with 1/4″ birch plywood because water ended up penetrating the MDF, causing mold and a bad smell. 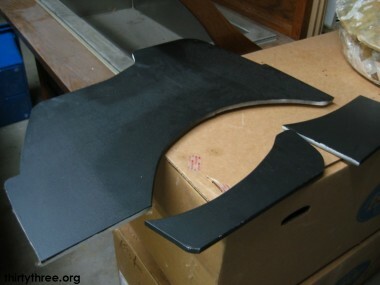 The new pieces will be made out of hardwood, and primed and painted with oil based paint. Final pictures spring/summer 2013. Here you can see one of the tabs installed. 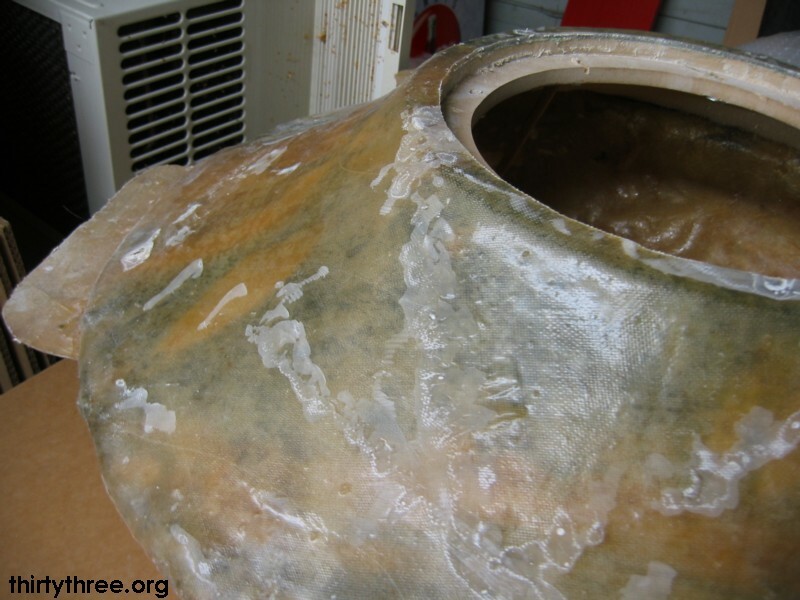 In this picture the third and final layer of fiberglass was laid and I had used the same carbon grinding wheel to clean up the imperfections in this layer of fiberglass. 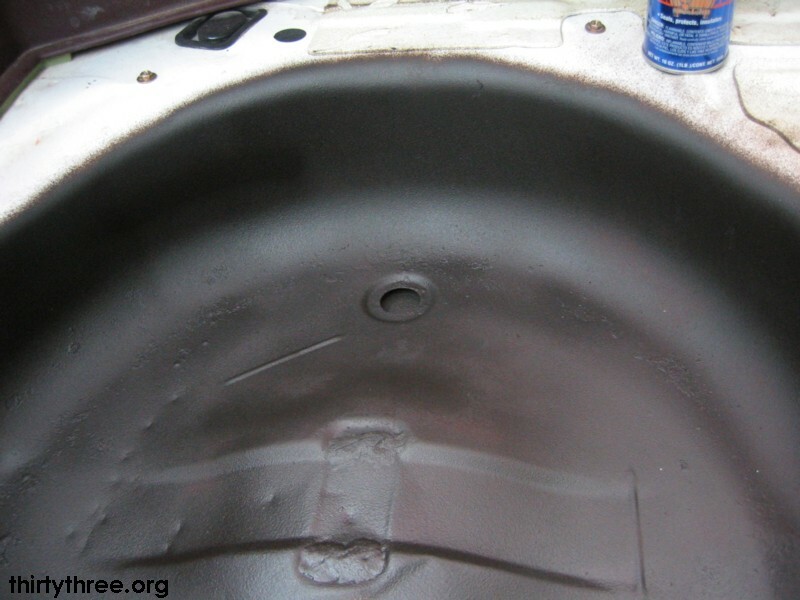 The more cleanup work you do now the easier it will be to correct with body filler later. I used a different brand of resin (West System) which I had available to me to seal the layers together. It flowed better than standard resin which worked out really well for this use. I made sure to work out all of the pockets of air, and made sure all of the resin went into the small cavities around the edges. This is an example of why cleanup of this edge was so important at each stage, it enabled me to get a clean join between halves. I was very happy with how this came together. Here you can see the enclosure, fiber-glassing completed. It is as strong as it is going to be with 3 layers of glass and 4 of resin. You could theoretically mount and install the box now, but I wasn’t about to looking like that. This is the enclosure with the first layer of bondo body-filler applied. This is after 2 layers of body-filler and one thorough job of using a wood-filler to fill in the remaining rough spots. For now I planned to clean it up well and painted it flat black. You could continue the smoothing process and eventually get it to the point where you could make it smooth enough to look good with a glossy paint job. Jump forward a bit and here is the finished product, mounted firmly to the car and with the sub floor installed. Everything fit together as tight as it looks and that was my favorite part. I really wanted something solid that would really be a part of the car. At this point I knew that I had put everything together right and it felt great. This is a picture of the first day of electronics installation. My friend Luke is helping me complete the task of running wires and mounting electronics. This was a great day for me, because as you can see from the dates of progress, this project has been going on steadily all summer long. Here is my setup installed with a 1.5 farad cap, a 900watt Kenwood mono pushing a disguised Alpine Type-R 12. The light colored 4 channel kenwood above it is one i’ve had since about 98′ when I was in highschool and had my first car. I bought the kenwood KAC-746 from my friends older brother and it still works great. It’s going to get upgraded eventually to give the Polk/Infinity interior speakers some more volume. You might be wondering why my sub looks the way it does. It was subjected to water damage due to a season of leaking targa seals! I started by thoroughly RTVing both sides of the seals, then I cut open the cone and scored the inside of the aluminium voice coil. I then dropped a few thin layers of fiberglass cloth over it. It took and has been clean and reliable for the past several years. This is another great example of how your new fiberglass skills can be used in a variety of other areas. This is my finished work, I bought a pegboard and 1″ dowells and traced out a design with cardboard. 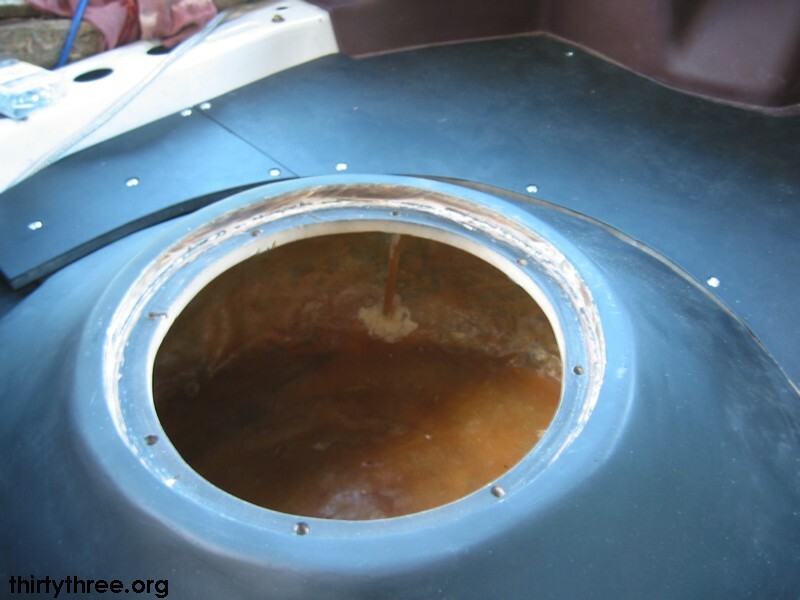 It is removable and creates a vented, breathable lightweight floor surface that sits off the amplifiers. Nearly stock look with limited wasted space and increased storage. Lately performance mods and tuning seem to be taking up most of my time and attention right now and so it’s nice to have such a functional truck for the targa to sit into and a stereo in my car with such great sound. I can easily throw a bag or two of golf clubs in it. 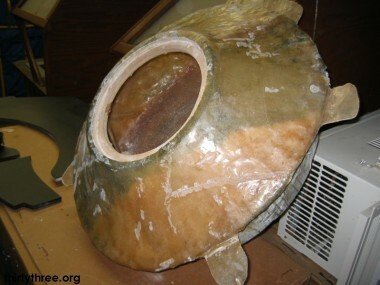 Thanks for checking out my fiberglass fabrication project. I hope that it might have helped your own along, or inspired you to take on such a project, though I realize it may have discouraged you from it at the same time. I learned that taking on a project like this is a lot of work, takes time, and does cost more money than I had anticipated. I estimate I spent around 150-200$ on this project in materials alone, not to mention all the time I put into it after work. It was a fun learning experience and kept me busy in the evenings while my friends were working dinner shifts at the Vermont summer resort I was working at in the summer of 2006. 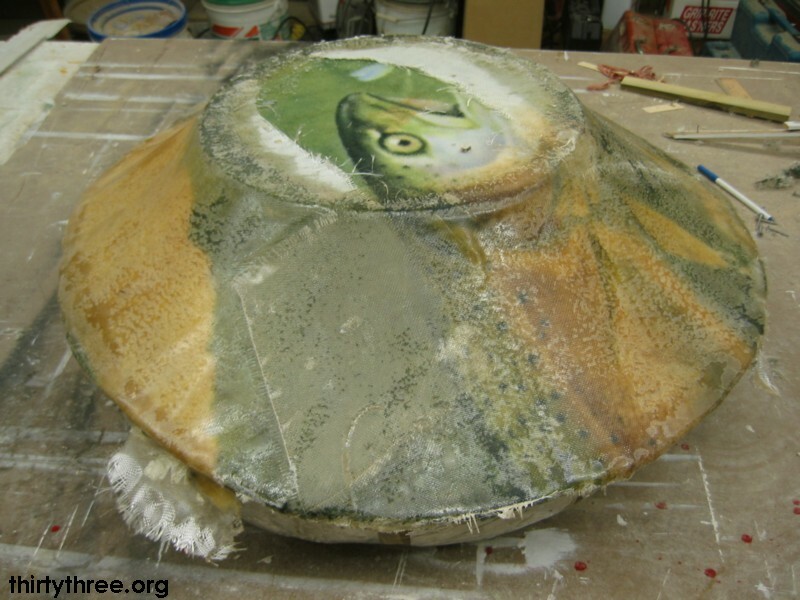 I learned through my friends project that working with smaller pieces of fiberglass cloth that you paint with resign before applying to complex curves and surfaces makes it much easier than working with dry, large pieces. 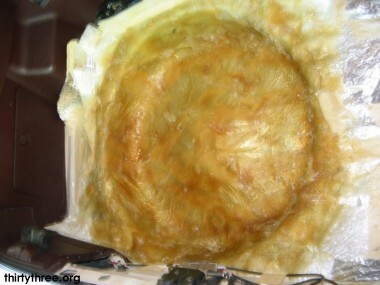 Break up your fiber-glassing work into several days to allow areas to partially cure before applying another layer. Don’t use MDF for the floor of your trunk. I only painted one side with the oil based black which was a mistake, it soaked up water and smelled like mold. 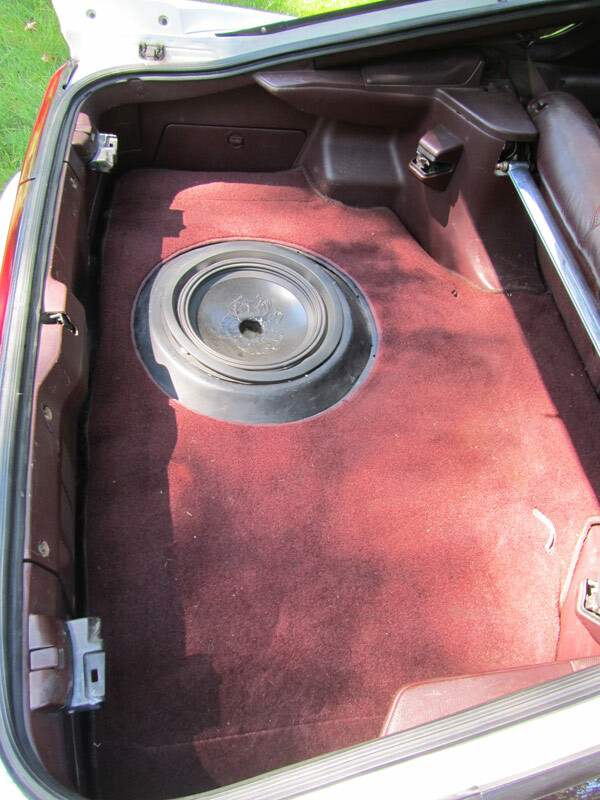 In 2013 I replaced all trunk sub-floor with Birch 1/4″ plywood that I thoroughly prepared and painted so that it would not absorb moisture. Contact me if you have any questions about this project or if you have questions about the process I haven’t answered here.